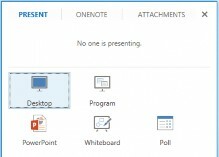 Lync Web App provides a rich video experience for meetings. If you have a camera connected to your computer, click to share your video with others in the meeting. A camera is required only to share your video, not to view the video shared by others. Participants who don't share their video can choose to display a static picture instead. The area of the screen in which the pictures or videos are displayed is called the gallery. There are two layout options to display the pictures and videos being shared. You can also expand the size of the meeting window to view the meeting stage in greater detail. Click to go to the full window mode. To return to the normal window size, click the icon again. If you don't have Lync 2013, you can join a scheduled Lync Meeting from Lync Web App. In the meeting request, click Join Lync Meeting. 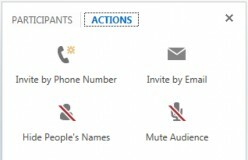 Type your name in the text box, ensure the option to install the Lync Web App plug-in update is selected, and click Join the meeting. The plug-in is required to use computer audio. After it's installed, you can also share your video and programs. To speed up your entry into future meetings, select the Remember me check box. Depending on how the meeting was set up, you'll either wait in the lobby or be admitted to the meeting. If you're in the lobby, only a presenter can admit you to the meeting. All presenters immediately enter the meeting. After you're admitted to the meeting, you can use your computer's speakers and mic, or a headset to participate in the meeting. In the meeting request, click Join Lync Meeting. 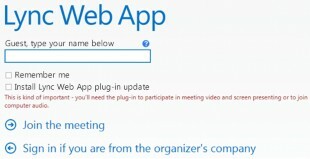 Type your name in the text box, ensure the option to install the Lync Web App Plug-in is not selected, and click Join the meeting. 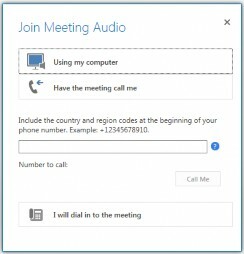 After you're admitted to the meeting, in the Join Meeting Audio dialog box, click Have the meeting call me to enter a phone number where the conference can call you, or click I will dial in to the meeting and call one of the phone numbers listed in the meeting invitation. tab displays the participant list. If you're a presenter, you can manage participant privileges. Right-click a participant and select Mute, Unmute, Remove or Make an Attendee. You can invite additional participants during a meeting. Click ACTIONS. To invite using their phone number, click Invite by Phone Number. To invite via email, click Invite by Email. To hide participant names in videos or pictures, click Hide People's Names. To mute all the participants simultaneously, click Mute Audience. During the meeting, you can share your desktop, or one or more open programs. To share your desktop, click Desktop. The meeting stage displays You are currently sharing Desktop, and the desktop is outlined in yellow. To share a program, click Program and in the Present Programs dialog box, click the program you want and then click Share. During a sharing session, a sharing toolbar is displayed at the top of your screen. You can hide or unhide it by clicking the pin icon. Click GIVE CONTROL to share control of your sharing session with another participant. You can take back control at any time by clicking GIVE CONTROL, and then Take Back Control. To end the sharing session, click Stop Presenting on the toolbar. dialog box, click Browse to select and open the presentation to share. THUMBNAILS to select a specific slide, and NOTES to see presenter notes. Click on the upper right corner of a slide to display the annotation toolbar, to use tools such as highlighters, stamps, and laser pointer. The presentation can have embedded hyperlinks. Before you click them during your presentation, you must hide all annotations in the presentation by clicking Hide Annotations in the annotation toolbar.